Peach Dutch Baby Recipe - Great for A Quick & Impressive Breakfast! I love breakfast for dinner, but sometimes I just want more than scrambled eggs and toast. Tonight I took a recipe for a berry dutch baby recipe and reworked it to go with canned peaches. I live in the mountains of Colorado – we definitely have seasonability when it comes to fruit. We also cannot get all kinds of frozen fruit year round. I ran out of frozen peaches a few weeks ago – and right now cannot find any in the store. I can find canned peaches – so I grabbed one of those at the store to have on hand just in case. This recipe was my “just in case” moment! Dutch babies are actually a form of skillet pancake that originated in Germany. They’re baked in a super hot cast iron skillet and work great while at home or even while you’re camping. These puff up HUGE around the edges as you can see below. As soon as you remove this from the oven it will start to deflate, so this isnt a brunch recipe, it cant sit at room temp and be tasty 1/2 hour later. If you try this over the campfire, remember you’ll need a lid for your cast iron dutch oven if you make this while camping though! Peaches and almonds just go together, so I modified a bit more and used almond extract instead of vanilla as the original recipe called for. This one has great flavor and is perfect served with a little sprinkling of sliced almonds on top. Let me know what you think! Preheat your oven to 450 degrees, put a large cast iron skillet in the oven to preheat - 10-12" in diameter works best. While pan is preheating, put peaches, 1/2 tsp of almond extract and cinnamon in a saucepan and turn heat on to low. You just need to heat through, you don't need to cook these unless you're using raw or frozen. In that case, cook until soft with a splash of water. Pull your preheated pan from the oven and melt the 3 Tbsp butter in the bottom of the frying pan. As soon as butter melts, pour in batter and return to oven, set timer for 20 minutes. 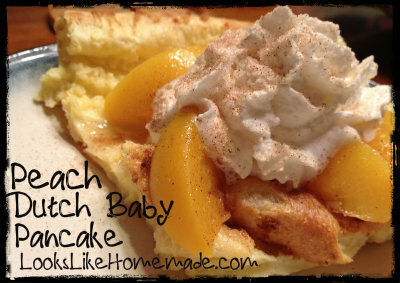 When the pancake is finished, place on a serving plate and top with peaches, whipped cream and a dash of cinnamon or powdered sugar.